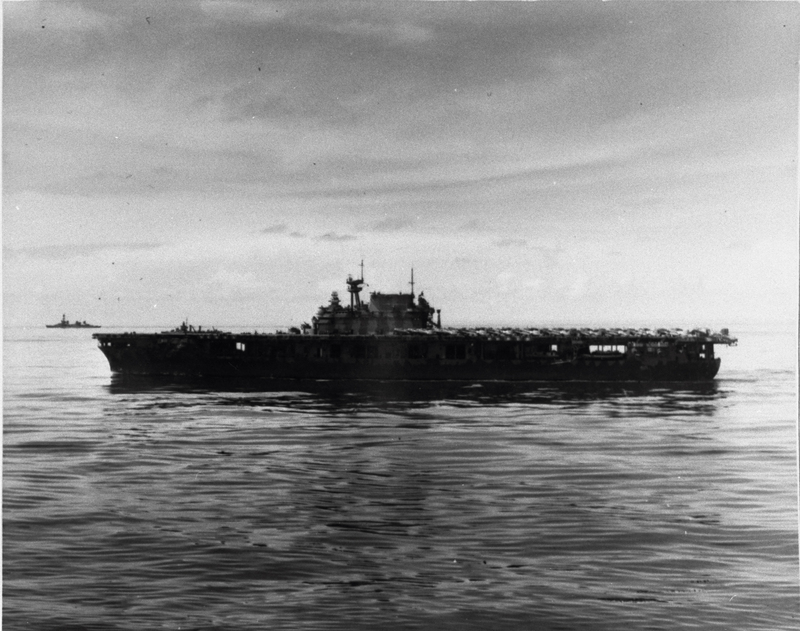 USS Hornet at sea shortly after the Doolittle Raid in the spring of 1942. During the struggle for Guadalcanal in the fall of 1942, the U.S. Navy fought two carrier battles against the Japanese. The first, at the end of August, was later called the Battle of the Eastern Solomons, while the second took place two months later on October 26,1942. Known as the Battle of Santa Cruz, the outnumbered Americans faced four Imperial Japanese flat-tops with only the USS Hornet and Enterprise along with their associated screen of cruisers and destroyers. 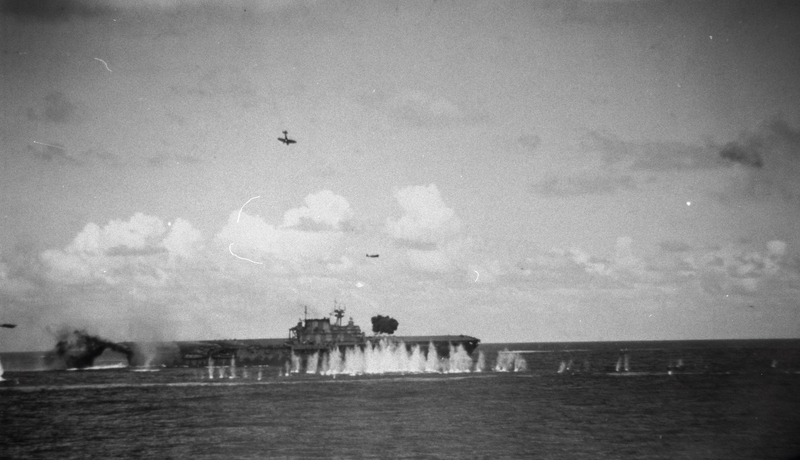 In a series of air attacks lasting throughout the day, the U.S. Navy’s dive and torpedo bomber pilots managed to heavily damage two of the four Japanese carriers. In return, Japanese D3A “Val” and B5N “Kate” crews found and crippled the Hornet. During the first air attack against the Hornet that day, she was hit simultaneously by Val dive bombers and Kate torpedo aircraft. Twisting and turning to dodge their weapons, the Hornet’s crew battled valiantly, inflicting heavy losses on the attacking aircraft. 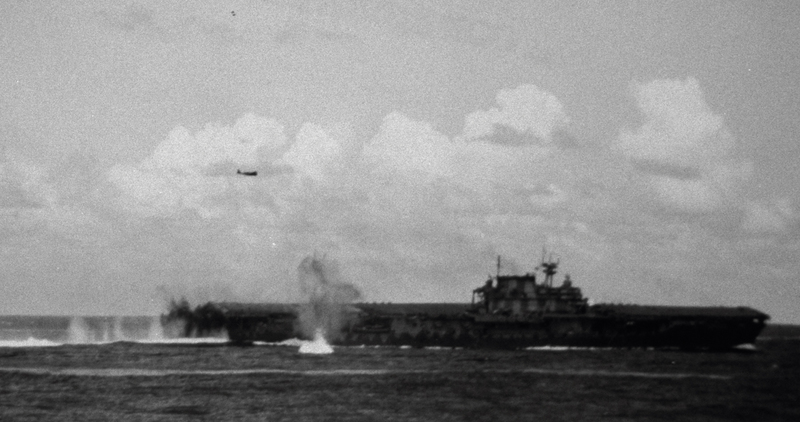 The first four Vals dove and missed, their bombs sending up geysers of water on either side of the Hornet. Then at 0914, only a minute after the third bomb had struck the Hornet, veteran Japanese D3A Val pilot Shigeyuki Sato nosed down and plunged after the American flat-top. Below him, as the deck welled up in his bombsight, desperate gunners poured a fusillade of fire up at his screaming Val. Flak ripped through his wings. He stayed on target. More hits rocked his Val. His nose never budged. Shrapnel slashed his fuselage. Fire erupted from the engine, and as flames licked along the Val’s belly, Sato never flinched. Whether he was dead at the controls, or brave beyond reason will never be known. Either way, his crippled bomber slammed into the side of the island, its right wing tearing through the signal halyards before grazing the ship’s smokestack and breaking free from the fuselage. 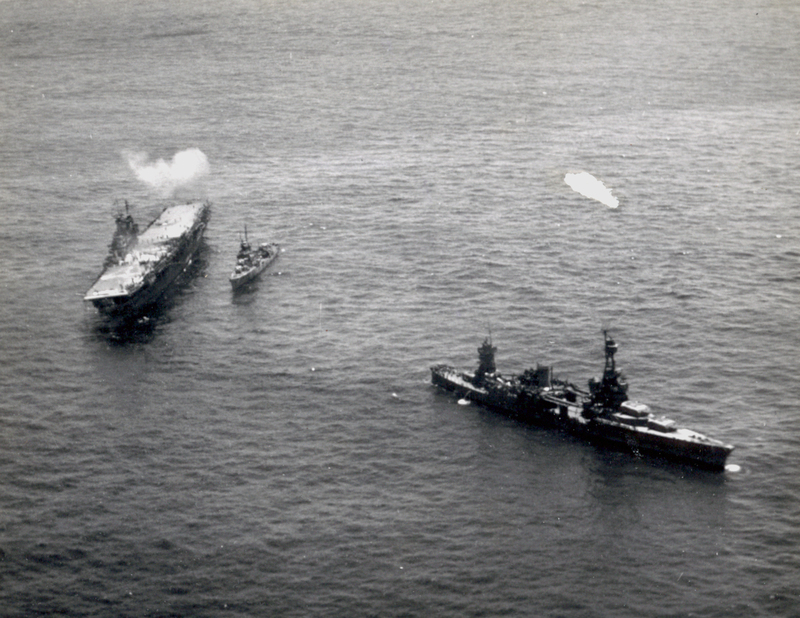 A fuel tank ruptured, spraying the signal bridge with flaming aviation fuel as the Val careened off the island and exploded on the flight deck. Sato’s bomb fell into the companion way in front of one of Air Group 8’s ready rooms, while part of his aircraft fractured the flight deck enough to prompt a rain of flaming avgas to stream into the ready rooms. Shaken, the reserve crews and pilots were forced to flee the liquid fire. It would be hours before this blaze was brought under control. The vital carrier was abandoned late that afternoon, and efforts to tow her clear of the engagement failed. Her escorts attempted to scuttle her, but the ship defiantly remained afloat until finished off by a small Japanese surface task for that night. Shigeyuki Sato dives his Aichi D3A “Val” bomber into the USS Hornet on the morning of October 26, 1942. Commander Lawrence Bean, a native of Long Beach, California, served as a surgeon aboard the USS Hornet and was with the ship that day during its final hours. He rode out the first attack at his battle station three decks deep inside the carrier’s hull. He was assigned to sickbay, where he heard the anti-aircraft fire and felt explosions from bombs and torpedoes as they ravaged his ship. When power failed, the men with him saw to their battle lanterns, but they produced only halos of light in the darkness. As they waited there for wounded men to treat, Bean began to smell smoke. As the minutes passed, the smoke became worse, as did the starboard list. Somebody announced, “Prepare to abandon ship!” Bean led his corpsmen and pharmacist mates to the hatchway leading upward, but the battering the Hornet had just endured had jammed it shut. At first, the warped hatch defied their attempts to gain entry, but finally somebody pried it loose, and they emerged on the hangar deck. Bodies lay sprawled on the deck. Smoke shrouded the scene, and fires raged around them. As Commander Bean picked his way through the wreckage, he overheard a pharmacist’s mate sneer, “What a time to sleep,” as he stared at the dead men. His mind just refused to register what his eyes had seen. Up forward, in the elevator pit, the fuselage of a Japanese plane lay encased in flames from its ruptured fuel tanks. Nearby sailors had seen the Japanese crew roast alive as the fire engulfed them after their crash. Now, their burnt corpses were twisted and blackened, but mercifully still. The Hornet under torpedo and dive bomb attack, October 26, 1942. Bean moved through the hangar deck, treating the wounded lying nearby. Using battle dressings and supplies from emergency medical boxes, he and his men went from sailor to sailor, applying bandages and injecting morphine. While he worked with his corpsmen, he learned the fate of his fellow doctors and friends. Spread throughout the ship at battle dressing stations, almost every doctor aboard the Hornet had been killed or incapacitated by this first Japanese attack. Most were killed outright as every battle dressing station was wiped out. Only a few doctors and dentists survived those five cataclysmic minutes. As Bean continued to treat the many wounded, four sailors lifted up Sato’s bomb, which had fallen into the companion way in front of Air Group 8’s ready rooms. The bomb sizzled and hissed, but the four sailors manhandled it over the side, where they watched it tumble into the ocean. Bean saw that and thought them foolish. Had the bomb exploded on impact with the water, all four men would have been vaporized. As the morning wore on, the crew managed to contain the fires and reduce the ship’s list to about 2 degrees. But with the engineering spaces flooded, the Hornet was not going anywhere under her own power. While the damage control parties worked, Bean and the other medical personnel moved the wounded to the ship’s fantail in the hangar deck. 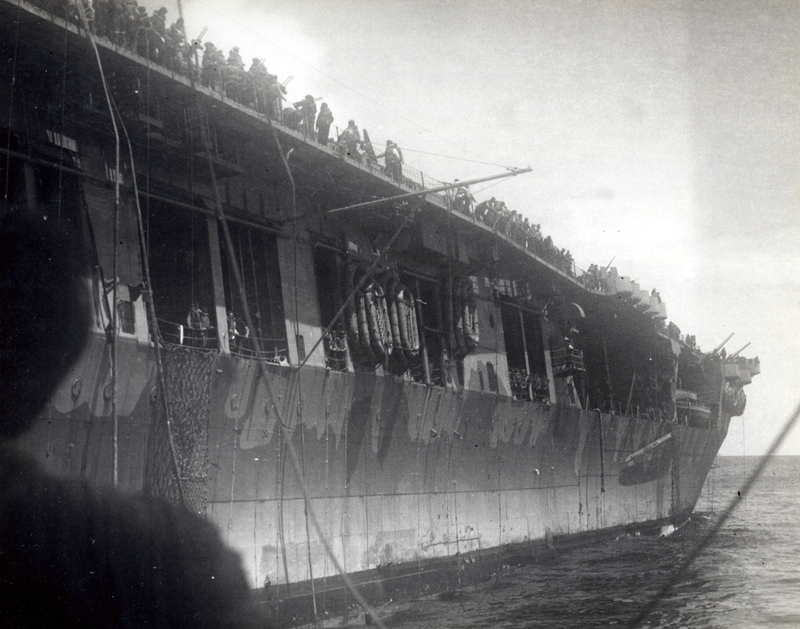 Eventually, they were all removed from the ship and taken aboard two destroyers. Heavy cruiser Northampton and a destroyer stand by to rescue the Hornet’s crew and attempt to take her in tow during the afternoon of the battle. Without any more casualties to treat, the doctors and corpsmen began identifying the dead, a horrible and frustrating task made even more difficult by the fact that about half the ship’s company had not worn their identification tags that morning. At one point, Bean came across an entire gun crew whose men had been decapitated by one of the bomb blasts. When the dead were finally gathered and identified, the Hornet’s chaplain said a few brief words, and the men were buried at sea before the next Japanese attack. Bombers struck the Hornet again, and Bean was forced to take a helmet removed from a dead sailor and use it for his own protection. He lay on the deck watching the flak claw down several planes, but the Hornet shuddered once again as more weapons struck home. The list returned, this time edging past 15 degrees. It was time to abandon ship. Along with the rest of the crew, Bean went over the side—but not before checking thoroughly to make sure no wounded men were being left behind. In the water, the Hornet’s crew endured another bombing attack. Later, they were strafed. Fortunately, nobody around Bean was hurt in either case. The two attending destroyers picked up the men, but by the time they got to Bean, he was so weak he could not climb up the knotted rope thrown over the hull to him. Twice he tried; twice he splashed back into the water. Being over 40 years old did not help that day at all. Finally, just as another Japanese attack began, he made it to the deck and was hauled aboard. That night, he dreamt incessantly of Japanese planes, dive bombing, launching torpedoes, and strafing men in the water. The crew of the Hornet prepares to go overboard and abandon their crippled flat top. It was an ordeal he’d never forget, and one that at least in some ways prepared him for his war to come. In the ensuing two years, he had two more ships shot from under him. It was a hell of a way to fight a war for a middle-aged doctor from sunny California.